Cartoning Systems for Folding, Seaming and Sealing Cartons | PAK Automation Ltd. Designed to erect, close, fill and close cartons, cartoning machines are widely used in a number of industries. Some of the more prominent applications take place within Foods, Pharmaceuticals, Cosmetics, Toiletries and Consumer Goods. At their most basic cartoners close the flaps of manually erected and filled cartons at low speeds. As the level of complexity increases, cartoners can process several hundred cartons a minute and include pick-and-place loading or stacking features, leaflet insertion, and coding devices. In recent years cartoning machines have benefited from the introduction of programmable controllers, servo technology, and synchronization software. 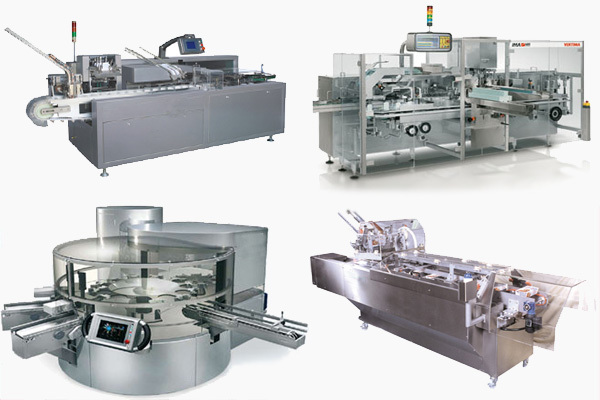 PAK Automation supplies a range of cartoning machines to meet the needs of its customers. These include fully automatic cartoning, semi-automatic cartoning and high-speed cartoning solutions. The operator manually loads the product into the cartons and places the cartons into the machine in-feed rails. The operator then pushes the cartons forward into the machine. The cartons are detected and applied with hot melt glue and automatically folded and sealed. The operator manually loads the product into the cartons and places the cartons into the machine in feed conveyor. The machine then applies hot melt glue and automatically folds and seals the carton. The cartons are then ejected from the machine by the driven discharge out feed belts. The machine carton magazine is loaded with flat blanks. The machines rotary erector selects a blank on demand and erects it into the moving flight chains. The carton flaps are spread and passed by the product load area ready for the carton to be filled manually. The carton is then automatically folded sealed and ejected through driven out-feed belts. The standard machine is a modular design and is available in a number of different formats to suit a range of applications. The unit is available in Glue or Tuck closure and 6″, 9″, 12″ and 15″ pitch depending on the sizes of the cartons to be run. This machine is available as fully automatic. The machine’s sleeve magazine is loaded with standard pre-glued five crease sleeves. The machine selects a sleeve on demand and opens it into a forming tool. The machine then passes the opened sleeve by a product load area ready for filling manually or automatically. The sleeved product is then ejected in line through discharge belts. The standard machine can be fitted with semi or fully automatic in-feed systems as shown opposite. These units offer a simple robust and reliable machine that can run a wide range of sleeve sizes and designs including full, bands and watch strap sleeves. The standard machine is a high spec unit incorporating a long list of unique features as standard. The unit is simple to operate, maintain and changeover. The machine can be changed from size to size in under five minutes on most applications. This machine is available as fully automatic. The machine accepts random supply of products from the line, automatically selects, and loads the required number into the machine. A sleeve is selected from the sleeve magazine and placed directly on the products. The sleeve is then automatically folded and glued. The sealed sleeve is then ejected through driven discharge belts. The machine automatically selects a flat blank from the magazine and transfers it under the glue applicator guns. Hot melt glue is applied and the blank is delivered under the forming head. The forming tool erects the finished carton which is then ejected from the bottom of the mould and dropped onto either an offend chute or conveyor.